The EU's flagship federalist policy of abolishing mobile phone roaming charges looks likely to be scuppered by MEPs tomorrow. UKIP MEP, Roger Helmer, has tabled an amendment to the proposed regulation on the grounds that it gives the EU Commission more power and will drive up bills for the majority of customers who will be expected to subsidise the minority who travel regularly throughout the EU. The EU are desperate to abolish mobile roaming charges because it's one of the things that emphasises the national borders within the EU. There is no need for EU regulations forcing mobile phone operators to abolish roaming charges within the EU, it is something that the market will eventually drive. In recent years mobile phone companies have introduced add-ons that significantly reduce the cost of using your phone abroad in response to increased overseas travel and one of the UK's operators even allows you to use your mobile phone in 18 countries as if you were in the UK. Companies specialising in cheap calls to and from certain countries serve ex-pat communities by buying call time wholesale and of course VOIP services like Skype, Hangouts and Facetime allow you to make calls for free wherever you can pick up wi-fi. None of this has been as a result of EU regulations and in fact forcing all operators to negotiate roaming deals with operators in every EU country could see some fail. Estonia has just 2.5m subscribers divided between three mobile operators. Estonians travel a lot but Estonia isn't exactly top of the tourist destination list. They are likely to receive far less in revenue from operators in other EU countries than they will pay out to foreign networks for airtime and data used by Estonian subscribers. The likes of Orange and Vodafone who have a presence in most countries will dominate and prices will rise as a result. 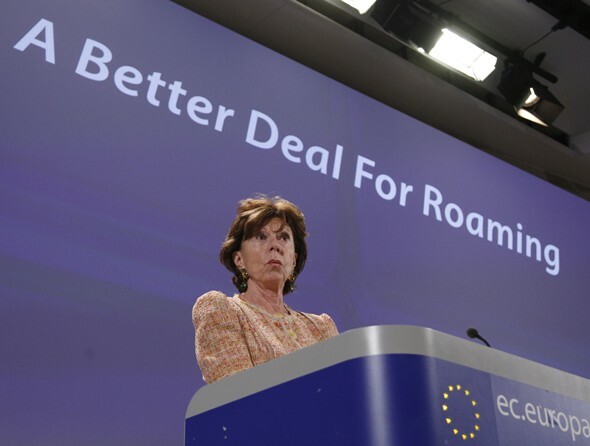 Whilst abolishing roaming charges in the EU will benefit those looking to abolish national borders and pushing a federalist agenda, it will disadvantage the majority of customers who will never take advantage of the abolition of roaming charges but will still pay for it through their bills.